I know, talking about beard growth serum or “beard spray” is one of the biggest red flags there is, and I know it makes me look like one of those scammy snake oil salesmen who try to peddle their questionable beard enhancers online. Sorry about the flashy claims, and sorry about the fact that about 95% of the beard blogs out there are happy to lie on behalf of the sneaky hustlers who sell their ridiculous beard growth sprays. The truth is that there’s only one real scientifically-proven “beard serum” out there, and that is the prescription-free hair-loss drug; minoxidil. (yes it works for facial hair, and yes it has been studied for use on beard growth as well). Pure scams, making bold claims. Usually, contain just olive oil or essential oils in a dropper bottle. Or if they’re supplements they are underdosed kitchen-sink multis. And most often the beard growth products come with a $40-100 price tag. But today, I’m going to expose you a somewhat of a underground recipe for something that has actual scientific validity for boosting the growth of facial hair. It works through a natural pathway of altering prostaglandins in the hair follicle, similar to what minoxidil does, but naturally. Below is our recipe to this natural beard enhancer. It contains just two ingredients and is very easy to make at home. The effects are based on manipulating prostaglandins (PGD2 & PGE2) for faster growth. To understand why this recipe is so powerful, you have to first understand a bit about the prostaglandins (PG). They are naturally occurring hormone-like eicosanoid fatty acids that can be found in nearly all of the tissues of humans and animals. There are many different prostaglandins, and depending on the tissue they are located in, they can have a wide range of enzymatic and biological activities. When it comes to the purpose of this beard growth serum, we need to focus on only two of them. Prostaglandin E2 (PGE2), which activates the anagen (growth) phase of the hair follicle, and increases circulation locally in the tissues (vasodilation)1,2. Prostaglandin D2 (PGD2), which inactivates hair growth at the follicle by stimulating the telogen (rest) phase of the hair, and reducing circulation locally3–5. It has been shown that when any skin tissue has high amounts of PGE2 and low amounts of PGD2, the conditions are optimal for hair growth to occur, and more hairs remain in the active anagen phase. While on the flipside, skin tissue that has low amounts of PGE2 and high amounts of PGD2, usually sees hair-loss, and miniaturization of the follicle. So what our goal with this beard serum is, is to naturally promote PGE2 while suppressing PGD2, to provide optimal growth conditions for the follicle. In a way, we are mimicking one of the mechanisms of the proven beard growth enhancer; minoxidil, which is known to activate the prostaglandin E2 (PGE2). As I said, the ingredients to making the DIY facial hair growth serum are ridiculously simple. 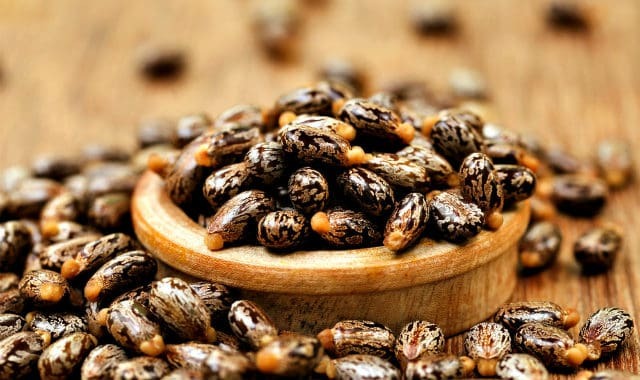 You need some castor oil, which has been shown to increase PGE2 levels quite significantly6, while also blocking the receptors for PGD27. Exactly what we are looking for in terms of optimal growth conditions prostaglandin-wise. Castor oil, when its used solely as is, it is thick enough to create a visual impact of a thicker beard. However, without a carrier agent, you can’t get it the active ingredients into the hair follicles in meaningful amounts. Most will only absorb to the outer layer of the skin if used as pure oil alone, which is why another ingredient comes into play. And the second ingredient is a carrier liquid. If you mix the castor oil with alcohol (ethanol) or some other permeability enhancing carriers like DMSO or propylene glycol, you can make it permeable enough to reach the hair follicles and to have the ability to modulate the PGE2 and PGD2 within the hair follicle cells. Take 1oz. glass bottle (dropper bottle or regular). I ran out of dropper bottles when making this batch, but that would probably be the best option. Get some pure castor oil, I used the NOW brand. For this specific use, it’s better to use pure castor instead of black Jamaican castor oil (fewer impurities). Then get a carrier liquid. Luckily I had some 95% proof spirit my friend brought me from Poland. Anything 40% and above should work, like vodka. Fill the dropper bottle with about 70% castor oil and 30% alcohol/carrier liquid. The less proof your carrier alcohol has, the more you need to use. Put the cap back on tightly. Shake the mixture vigorously for a minute so that it mixes. You should now have a beard serum that has a similar texture to minoxidil. And that’s that, an inexpensive prostaglandin modulating DIY beard growth formula. Guaranteed to work better than any of those scammy growth oils or facial hair growth sprays you are bombarded with. NOTE: I can’t take credit for this recipe or the idea. A user by the name of /u/SwissTemples posted about this long time ago on a hair-loss Subreddit and provided some good progress pictures about how it helped him regrow his temples (while also mentioning in a post how it thickened his beard significantly). So that’s it, your DIY recipe for some amazing beard growth enhancer. Full credit of the idea goes to /u/SwissTemples and his research + anecdotal tests. If you’re looking for a more natural alternative for reaping some of the scientifically-proven benefits of minoxidil (with arguably fewer side-effects), give this serum a try. After all, it’s inexpensive and apparently highly effective. Some also report great results when they combine this type of serum with microneedling (Derma Roller) and since it likely improves the absorption of the mixture to the hair follicle, even more, you could definitely give it a go as well. Malkinson F, Geng L, Hanson W. Prostaglandins protect against murine hair injury produced by ionizing radiation or doxorubicin. J Invest Dermatol. 1993;101(1 Suppl):135S-137S. Zhang Y, Desai A, Yang S, et al. TISSUE REGENERATION. Inhibition of the prostaglandin-degrading enzyme 15-PGDH potentiates tissue regeneration. Science. 2015;348(6240):aaa2340. Garza L, Liu Y, Yang Z, et al. Prostaglandin D2 Inhibits Hair Growth and Is Elevated in Bald Scalp of Men with Androgenetic Alopecia. Sci Transl Med. 2012;4(126):126ra34. Schrör K. Prostaglandin D2 (PGD2)–a potent coronary vasoconstrictor agent in the guinea pig isolated heart. Naunyn Schmiedebergs Arch Pharmacol. 1978;302(1):61-62. Nieves A, Garza L. Does Prostaglandin D2 hold the cure to male pattern baldness? Exp Dermatol. 2014;23(4):224-227. Tunaru S, Althoff T, Nüsing R, Diener M, Offermanns S. Castor oil induces laxation and uterus contraction via ricinoleic acid activating prostaglandin EP3 receptors. Proc Natl Acad Sci U S A. 2012;109(23):9179-9184. Fong P, Tong H, Ng K, Lao C, Chong C, Chao C. In silico prediction of prostaglandin D2 synthase inhibitors from herbal constituents for the treatment of hair loss. J Ethnopharmacol. 2015;175:470-480. Thanks for the recipe! I want to try to grow a beard without minoxidil. On your other posts, you recommend taking LCLT internally, but I read that 2% LCLT can be used topically to promote beard growth. People recommend mixing 2% LCLT with minox or Nivea soft because LCLT is water-based and mixes well with an alcohol solution, if I’m not mistaken. Since your serum has alcohol, what do you think of adding 2% LCLT to this serum? Thanks! Yeah, LCLT could be mixed into this as well, it would be a great addition. This one will likely at least reach the follicles more effectively. You could use them both, as this one tends to dry the skin a bit, but the growth oil recipe will help keep it moisturized. Tank you can I follow this rutine? For a daily básico growth régimen? Yeah, that should work really well for growth. Give it 6-12 months for best results and terminal hair growth.